If you haven't already won the listing before showing up to the listing presentation, there are a few other ways you can prepare before meeting the sellers that will ensure a slam dunk. Prove you're the best agent for the job at your next listing presentation by bringing these special materials along with you. Show sellers how prepared you are by pre-ordering the domain name for their home! Since we recommend building the property site before going to the listing presentation, adding a custom domain name is a quick and inexpensive way to really show your dedication to the sellers. Imagine handing them your laptop at the listing presentation and asking them to go to 100MainStreet.com (customized with their address). The sellers will not only be thrilled with the gorgeous property site you've created, but their customized domain name will instantly impress them. Bring the sellers a stack of Biz-Prop cards to hand out to their friends and family. With a gorgeous exterior photo of their home on one side and your contact information on the other, it will help the sellers associate you as their agent representative. We recommend including the property site URL, the text code or the QR code for the listing (all included with your single property website through ePropertySites). Prove you've mastered the art of property marketing by bringing the sellers a sign rider that incorporates an effective call to action and lead generating capabilities. Order a rider that displays the text code for the property, with the message: "Text for more info and pictures." Anyone driving past the home will get instant information about the listing, and you'll be sent a notification that allows you to follow up with them. The sellers will love your modern approach to marketing their home! The impact your listing presentation makes on the sellers will be much more powerful if you bring prepared marketing materials with you. 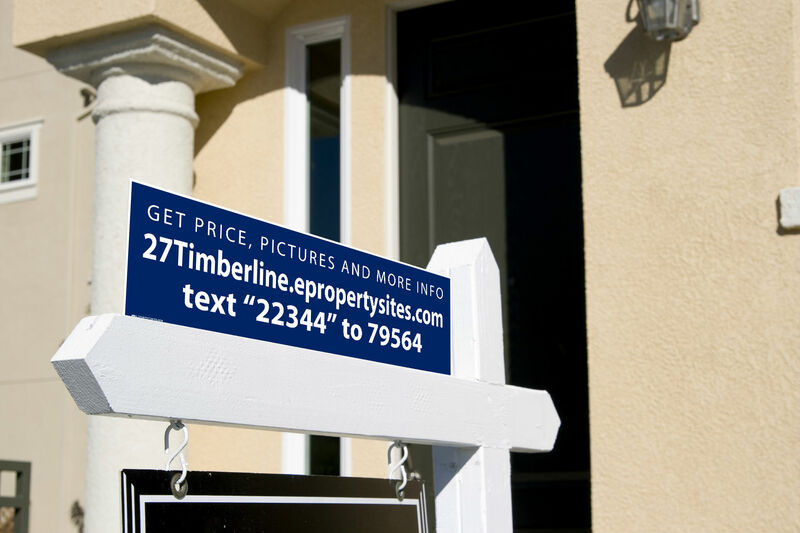 Don't just tell the sellers you'll build them a property site and order a customized sign rider: bring them to the appointment. Show them the completed property site and put the rider in their hands. With proof of your exceptional marketing prowess right in front of them, they'll be crazy not to sign with you on the spot! Thank you for calling attention to a very important feature that can be such a great asset to the agent!